Robert Ashton is the successful author of seventeen non-fiction books including his latest published works, Sales for Non-Sales People. He describes himself as a social entrepreneur, author and campaigner. He passionately believes that social entrepreneurship is as much an attitude as it is a skill. It can liberate and empower individuals, organisations and communities, enabling them to deliver sustainable profound social change. Robert uses his writing to help such groups achieve greater, positive social impact through achieving economic self-sufficiency. He challenges assumptions to find new ways to solve the problems that prompt people to approach him for help. Such a clear, well-thought-out structure created by a trustworthy businessman surely cannot fail to assist the most unlikely salespeople of his readership. Robert aims to help the reader in a few different ways: to learn the basics about how to sell and why people buy; to recognise the importance of goal setting and measuring personal performance; to understand how to find, then influence people able to contribute to their success; and to become more confident in taking the lead and steering things the way they want them to go, at work, home and in social situations. Robert has used his vast background knowledge of business and entrepreneurship to bring you an innovative piece of writing, that many can turn to for advice in how to succeed in business. We asked Robert why sales skills are crucial for entrepreneurs. He said that selling is like riding a bike; it might not be your core skill, but if you can do it you will get to your destination faster. He rightly stated that you can spend years developing the best product or service but if you cannot sell it, that innovation is wasted. In business, all ideas need to be adopted by others to progress. The use of selling skills will help you translate your goals into others’ wants and needs. Robert knows that selling is about listening to your customers and profitably delivering them what they tell you they need. Therefore, sales is really about conveying the hard work you have put in to your wonderful product or service. Many have found true success due to Robert’s book, whether it be an amazing promotion or simply some more confidence. 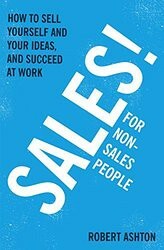 With Robert’s book, Sales for Non-Sales People, he wants to teach you to allow others to see the value you are offering. In his work, Robert is always independent. He bridges gaps between conventional public, private and third sector organisations. He has experience in many different aspects of business; large and small, education, health and housing. Robert is driven, ethical, honest and some say visionary: spotting opportunity where others see crisis.